Custom artscapes are what we do. For over forty years, our custom pools, spas, outdoor kitchens, and water features have been statements that simultaneously stun and inspire. To get there, our team of engineers, designers, and outdoor living experts has quietly developed the most comprehensive and helpful outdoor living organization in the greater Toronto area. Genesis 3 Design Group credentials ensure clients receive the most advanced expertise in water-shape design and construction. And our trend-right outdoor living boutique provides exclusive access to the finest in hot tubs, patio furniture, bbq’s, outdoor décor and water care. But, the BonaVista difference is one felt from the inside out. As a second-generation family business, we are proud of our history of exacting standards, innovative designs, and unwavering client focus. BonaVista founder Bob Brown advanced the art of custom pools with his professional engineering background, aesthetic focus, and preference for emotion-evoking memories. But it was BonaVista’s professional and unpretentious company ethos-its guiding principles-that he molded and protected most. Forty years ago, this meant clients were the heart of the process, the finest materials were insisted upon, and post-sale support was incomparable. Today, it is all of these things and more: One step into our Outdoor Living Boutique quickly reveals our contemporary design and service orientation, bespoke focus, and deft touch. BonaVista continues to extol the flexible and approachable virtues of its founder, our father, Bob Brown. Our business grows from client and industry referrals because we proudly, yet humbly, leave a little of our hearts in every dream built. Just as he did. We specialize in custom pools and complete pool renovations. From excavation to landscape, all our services are in house. We take pride in our work and it shows. What exactly do Newmarket pool builders do? If you are planning for a new pool in Newmarket, ON, a swimming pool builder will analyze your outdoor space and your aesthetic wishes to determine an appropriate design for your yard, installing it once the plan is developed and approved. Once installed, some pool companies in Newmarket, ON can handle the necessary cleanings, water testing, renovations and equipment replacement or repairs for your pool or spa. If not, many can also suggest Newmarket, ON swimming pool contractors or maintenance services to help with upkeep or repairs down the road. Here are some related professionals and vendors to complement the work of swimming pool builders: Garden & Landscape Supplies, Landscape Architects & Landscape Designers, General Contractors, Landscape Contractors, Solar Energy Contractors. Before hiring a swimming pool construction company to create your new Newmarket, ON pool, determine how you'll be using it. Will it be for fun or for lap exercise? Will the primary users be children, adults or a mix of the two? Knowing the use can help you find Newmarket pool builders who shares your aesthetic. Once you find swimming pool builders in Newmarket, ON who share your style, research is critical. Review customer references and comments, collect at least three to four estimates to compare, meet with potential Newmarket pool designers and builders in person and ensure that they are Ontario certified service professionals and licensed with the registrar of contractors before making any final decisions. In addition, get a sense whether they plan to complete the pool installation and be done with it, or whether they seem interested in building a long-term relationship with you. Be wary of the former: it's likely a reflection on the level of quality of the pool construction they do. 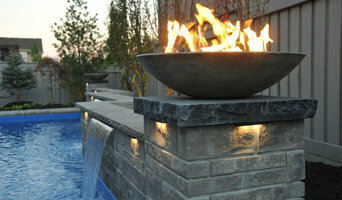 Find a Newmarket pool contractor or designer on Houzz. Narrow your search in the Professionals section of the website to pool builders in Newmarket, ON. You can also look through Newmarket, ON photos by style to find a pool or spa you like, then contact the local pool company who designed it.